Roasted Garlic Mashed Potatoes are so flavorful and make an easy side dish for the holidays and family dinners! 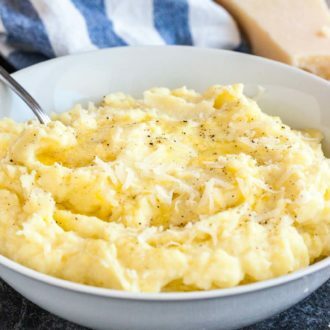 Loaded with roasted garlic and parmesan cheese these creamy mashed potatoes will surely become a dinnertime favorite. Slice off the very top of the garlic head and drizzle with olive oil. Wrap in foil, place on a baking sheet and bake until tender and fragrant, about 35-40 minutes. Remove from the oven and let cool slightly. Remove the cloves and set aside. Meanwhile, cut the peeled potatoes into 3/4-inch slices. Place them in a colander and rinse under running water for 30 seconds. Transfer potatoes to a large saucepan. Add cold water to cover by 1 inch, and bring to a boil over high heat. Reduce heat to medium, add salt and boil until potatoes are fork tender, about 20 to 25 minutes. About 5 minutes before the potatoes are ready, melt butter together with the half-half in a small saucepan over medium heat, about 5 minutes. Keep warm. Drain potatoes well and pass them together with the garlic through a food mill or ricer. I don't recommend using a food processor or blender! Gently fold in the warm cream mixture and parmesan cheese with a rubber spatula until absorbed and potatoes are thick and creamy. Adjust seasoning. Serve immediately sprinkled with parmesan and black pepper or cover with foil and keep warm in an oven on low heat.